A huge step forward has taken place in the development of the Cornish language after a single written form was agreed. The language has struggled to get official acceptance and funding because it has four written forms. Now the Cornish Language Partnership has agreed its Standard Written Form, it paves the way for it to be taught more widely with support from the EU. It also allows Cornish literature to be printed in one form, as well as on signs, in shops and in leaflets. There are four main versions of Cornish, Unified Cornish, Unified Cornish Revised, Common Cornish and Modern Cornish and it has taken two years of negotiations to agree a single form of the written language. 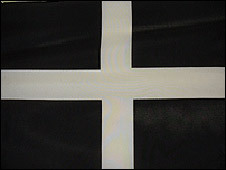 Although the language died out in the 19th Century, there are now believed to be about 300 Cornish speakers, about half of which use Common Cornish, developed in the 1980s. Dr Benjamin Bruch, who helped the Cornish Language Partnership in its two-year debate, said: "It is a critical and extremely exciting time in the history of the language. "There has been a huge change in perception and awareness of the language over the past 10 years." Dr Bruch, a former lecturer in Celtic studies at Harvard University in the USA, said the move could also bring a stronger sense of Cornish identity. "If you have no language you have no land. "A lot of people feel it is part of their identity, part of their heritage." He also said minority languages helped keep traditions and culture alive. "Cornwall is lucky because people are working hard to use it more and more. "It gives it a fighting chance when others are going." Cornwall County Council now wants the language recognised within the European charter for regional or minority languages. That could ease the way for EU funding for teaching which at the moment is restricted to DVDs in three secondary schools. Frances Bennett, teacher of Modern Cornish said: "Young children are really keen to learn the language. It's like a secret code to them. "There are very few languages that have the status of Cornish." Jenefer Lowe, development manager for the Cornish Language Partnership, said it was important to agree on an official form that would be used on road signs and in documents and schools. "The standard form draws on the forms already in existence. "This means that users of any form will find much that is familiar, alongside some differences. "Users who wish to carry on with their preferred form in personal use, will, of course, do so, but all official documentation will use the standard form."